In recent years, as people are getting wealthier, people are willing and able to afford a better life. Fresh products consumptions are increasing, some countries cannot meet this demand due to the natural environment limitation. The distances between each country are long and fresh products are easy to decay, therefore, there is a necessity to transport them under controlled temperature. It can guarantee the quality of fresh products. Seeing the market of transport fresh products is rising, there is also trade imbalance of fresh products, which is called reefer cargoes. In this paper, we address on the reefer container because it has the advantage of door to door service. The imbalance trade of reefer cargoes will result in the imbalance trade of reefer containers. Our main research question is to find out how to reposition them. In order to do the further research, we have determined types of cargo that are transported by reefer containers. Also we decided to limit our research area to Argentina, Australia, Brazil, New Zealand, and South Africa. These five countries lie in southern hemisphere and therefore the trade patterns are more affected by the season. The most important thing is that based on our assumptions, all the reefer cargoes are transported by reefer containers. We need to determine the number of reefer containers needed by the cycle. 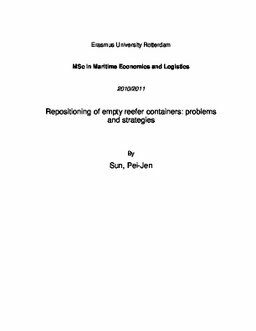 To solve the empty container problem, lots of researches aiming at developing a mathematical model to see what the most cost-efficient way is to reposition them. We also developed a mathematical model and it has two major variables. One is the transportation cost, the other is the holding cost, and we use the Solver in Excel to determine the lowest cost and the number of reefer containers needed to be repositioned. Furthermore, we compared the results from different assumptions and try to analyze them.